Electric Propulsion (EP) spacecraft thrusters are beginning to play an ever-more important role in station keeping and long duration missions due to their high efficiency and, at least theoretically, unlimited maximum power. Since this technology is still fairly new, it lacks an extensive space heritage. Any changes in the design of EP thrusters must be thoroughly tested in vacuum tanks, which tends to be an expensive and a time-consuming process. Therefore, multiple groups are working on a development of computer simulation models that can predict the behavior of a given thruster with a reasonable accuracy. One such a program is being developed at the Computational Advanced Propulsion (CAP) Lab at Virginia Tech. The goal of this development is to create a one-stop package, capable of solving plasma flow parameters for any user-specified system, and allowing the user to visualize the results using a 3D, immersed environment, such as the CAVE. However, no tool is readily available which can generate such an environment. The CAVE can easily display static models, but it does not provide the user with the ability to interact with the data, outside of being able to view it from any angle. Thus, the creation of the CAP Lab Virtual Testing Environment, or capVTE, ©2003 CAP Lab, software was initiated. Upon completion, capVTE will allow users to load in a 3D grid containing the results from a plasma simulation on both a desktop computer and the CAVE, witness the particle flow in real time, and study properties such as the charge distributions using tools like cutting planes and isosurfaces. A network protocol will be built into the program, allowing multiple labs to interconnect and simultaneously study the results. 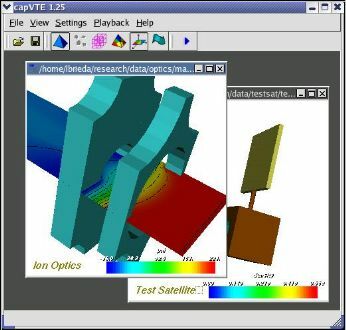 The Physical Model topic describes the main relationships of plasma physics and their application to computer simulation. A background on the DS1 thruster, as well as the problems associated with ion propulsion, is also given. The Tools section introduces Tecplot, a common visualization tool. It also describes the Diverse software developed at Virginia Tech. This is where a detailed overview of capVTE is given. The Analysis topic shows how the different features of capVTE were used to analyze the results of Dr.Joseph Wang's simulation of the interaction between the DS1 thruster and the satellite. The Online Collaboration page shows how the CAVE Collaborative Toolkit can be used to interconnect between several labs, and how a similar feature will be implemented into capVTE. The papers and texts used in the creation of this website are cited in the References section. Lastly, information about the author is available on the About page.